SUZUKI and Kawasaki look to have their work cut out to catch Valentino Rossi and the Honda V5 this season… or the next. All three factories tested at Sepang last week, and while Rossi and the RCV were making headlines for totally obliterating the lap record, the Suzuki XRE0 V4 was merely making steady if unspectacular progress. While Kawasaki, with its softer target of a full time GP entry in 2003, showed they’re likely to need every day of the next 12 months to catch up on lost ground. Suzuki rider Kenny Roberts said: " We are under no illusions about how difficult it is going to be. At the moment my job is to develop a new race bike and I accept that, but at least we are going to be back in a position of challenging for wins and a world championship. " 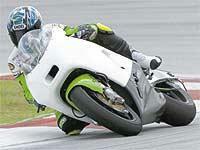 He added: " The new bike accelerates faster than the two-stroke, and has a higher top speed. But it’s deceptive. It doesn’t feel as fast. We’ve been working mainly on mechanical things like the settings of the slipper clutch and the power character.
" The new bike has got a lot wider powerband than the 500, a lot more linear. You spend a lot more time at full throttle than you do on a 500 - and the chain force isn’t quite as abrupt as the two-stroke so the rear end doesn’t sit down so much under acceleration. " Although no official times were released, Roberts’ team mate Sete Gibernau admitted they were " some way off " the pace required. If Suzuki are falling behind Honda, spare a thought for Kawasaki. Unofficial hand-timing by onlookers on day one of the Sepang tests clocked times around seven seconds behind Rossi’s spectacular best. By the end of the test, development rider and former World Superbike regular Akira Yanagawa had gone quicker but his times were still comfortably off the pace. Kawasaki bosses were quick to point out the machine is only an early prototype, running in a modified ZX-7RR superbike chassis, so at this stage, expectations shouldn’t be too high. Project leader Takashi Yasui admitted the bike uses a braced ZX-7RR chassis and the motor is " over 900cc " . The engine also uses parts common to the superbike. Yanagawa said: " The torque is much higher than the superbike, especially at low revs. I think tyres are going to be a big issue though because the rear has been spinning a lot on the exit of corners. " Yasui added: " The final engine will be different because obviously we will not be allowed to use any of the WSB parts to race in MotoGP to meet prototype rules. The final design has not been completed but it won’t be radically different. "